Ever heard yourself say these words to your child in public? Ever heard someone else say them? You know what happens, it’s like a green light for a power struggle. It’s like your child wants to make you even madder so you’ll give in. They push and push until you just can’t take the staring and humiliation anymore. And you give in, and it happens again the next time and the next time. You feel like your child is some sort of manipulative genius, right? I’ve been there, and I’m sure so have many of you. Guess what? Your child is not trying to manipulate you. There is no secret desire to embarrass you. So what gives? You’re at the grocery store with your three year old child, and you pick up a container of strawberries and place it in your cart. “Not that one! I want that one over there.” You stand firm and ask what the difference could be, they look the same to you. “That is the one we need. Put this one back, I like that one .” It’s just a container of fruit, no big deal. Now, this is a verbal child, and that makes a huge difference in how this could play out. But the bottom line is the same: do not worry about the other folks in the store judging your response. You are the parent (or guardian or grandparent…), and you need to approach each situation as you see fit. If your child doesn’t agree with your decision, react as you would had no one been observing. Children expect consistency and predictability from the adults in their lives, and that goes for every situation (I know I use these words often but they are just so true). And some of those power struggles are the child’s way of checking in just to make sure all the rules are still the same. My 9 year old will ask for something, I’ll say no, and he’ll say, “can’t blame me for trying.” If our young children could say this to us, wouldn’t it be so much easier? And let’s remember that all of us have either been there, or will be there at some point in our child’s life. I remember walking my child into preschool in his pajamas with only one shoe on one time. He was crying and whining, and all I could think was : “I’m so embarrassed. 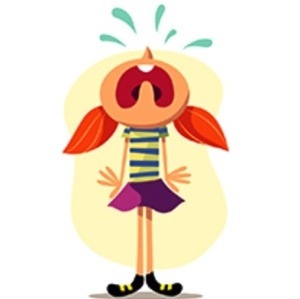 I’m an early educator in this community and my kid is acting like this?” Guess what? His teacher reminded me that the other parents were probably just relieved it wasn’t their child that day. She reminded me to take a breath, and be the parent that I had been just 10 minutes before when I told my child, “if you won’t get dressed, that’s your choice, but you still have to go to school.” I stood by that decision, and was so glad I did, despite the perceived judgement. It’s sometimes those moments that our children learn the most from us. So next time you’re on the edge of a public power struggle with your child , remember: you are still the parent you were before the scene began, and you’re not alone. “And some of those power struggles are the child’s way of checking in just to make sure all the rules are still the same.” Amen! Kids test to see where the boundaries really are. If you are consistent you’ll have less of those moments. But gracious, some kids are more scientific and require a bunch of tests to collect their data (Isn’t that a nice way to put it) on adult authority. I like that…the scientific approach is exactly how some children respond to and interact with their environment! Thanks for your comment!